Barska® 10x30 mm Floatmaster Waterproof Black Binoculars. These sturdy, buoyant Binocs were made for the open seas! Or your nearest lake. Don't miss a moment of the action during your next aquatic adventure! High-quality fully-coated optics and light-drinking 30 mm objective size team up to bring you images as clear as the deep blue sea. And don't worry about the Binocs falling overboard... they're waterproof and they float! Super-tough ergonomic rubber coating means these Binocs will last and last. The perfect companion for any fishing expedition or marine outing, get your Barska® Floatmaster Binocs here and save big! Measures 5 1/3 x 2 x 5 3/4" l. Weighs 17 ozs. Black finish. 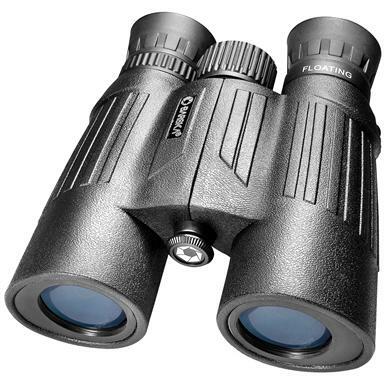 Barska 10x30 mm Floatmaster Waterproof Binoculars, Black is rated 5.0 out of 5 by 1. Rated 5 out of 5 by timbo from Great price, compact feel and clear view with the use of these binoculars! Rugged German made optics pull game out of surrounding terrain for easy targeting!